Enter into the heart of someone you admire by gifting this Cheerful 15 Assorted Gerberas in a Beautiful Bouquet that wonderfully paves a way for you. 15 Mixed Gerberas Arrangement with Cadburys Celebration pack. 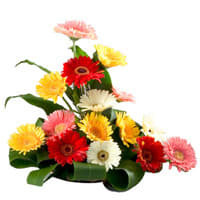 15 Mixed Gerberas Arrangement with 500grms Assorted Sweets. 15 Mixed Gerberas Arrangement with 16 pcs Ferrero Rocher chocolate box.